Books are the cheapest resource you can find for the highest ROI (return on investment). Reading does require your time, but it’s time well spent. My own definition of rich was (and still is) being debt-free, having a healthy savings, and making choices about work and life on my own terms. Everyone’s definition of rich is different and that’s okay! Personally, the journey of reading and learning made my head spin and my money multiply. It’s like sitting down with friends who are ready to share everything they’ve learned about wealth in order for you to achieve the same. I wholeheartedly believe you can read your way to riches if you read with an open mind and desire to change any bad habits. If you’re ready for that transformation, then I would recommend these five books described as a “starter library” for personal finance. The principles described are tried and true. Then you can grow your personal finance library as you seek more specific topics, such as investing or retirement. Here’s my personal finance book collection, minus a few that I keep in the RV. Some cross over into the entrepreneurial space, but they can easily go hand in hand. If I’m missing an essential book, please don’t leave this post without telling me in the comments, always looking for recommendations! Side note: I’ve tried reading on a tablet and I’ve tried audiobooks, just not for me! All of the books in my personal finance library have been helpful, but the five below led to the “a-ha” moments that were life changing. 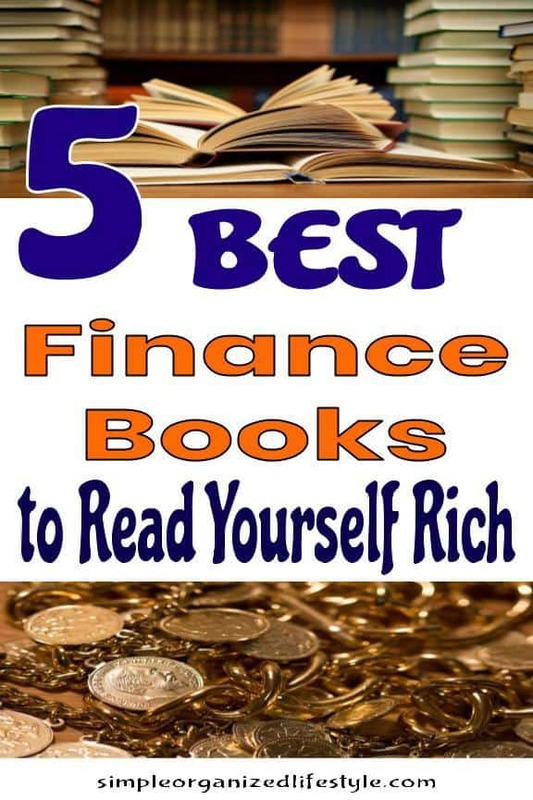 These five best finance books are definitely at the top of list for reading your way to riches! First up, The Millionaire Next Door by Thomas J. Stanley and William D. Danko. This book explores the habits and lifestyles of millionaires with interesting research and statistics. Don’t think college paper research… more like seriously, who knew kind of stats. It turns the “lifestyles of the rich and famous” into the lifestyles of your rich next door neighbor who drives a used Jeep Grand Cherokee and has sported the same Timex Easy Reader watch since he moved in more than a decade ago. Most of all, this book makes you realize that wealth is not for a select few. It ignites the “I can achieve this too” spark. And that my friends is where it all starts! Next, Your Money or Your Life by Vicki Robin and Joe Dominguez. This book focuses on aligning your values with your money. It considers the psychology of our relationship with money and helps us better understand our spending decisions. It’s like coming to the crossroads where finances and self-awareness meet. For me, it validated that there are different pathways to meeting goals and that my time is incredibly valuable. Debt freedom is our major goal right now and it helped me understand how to prioritize spending decisions based on our goal. It’s a book that you can circle back to time and time again when things are not going in the direction you desire. Third, written in 1926, The Richest Man in Babylon by George C. Clason, has stood the test of time. This was the very first personal finance book I read and it’s both simple and complex. It’s filled with ancient parable lessons about wise money management. The lessons learned through the stories take the reader on a journey of discovery and figuring out how to avoid making the same financial mistakes over and over again. It’s like listening in on a conversation between a wealthy mentor and an eager to learn student. The principles are woven in story and they stick with you. Fourth, another finance book that has been around for several decades, Think and Grow Rich by Napoleon Hill. This book uncovers how our thoughts ultimately lead to our circumstances. You have to “read past” some of the dated language and references, but it’s absolutely going to impact your life goals just as much your finance goals. There is power in aligning your plans with your purpose and going after it with fierceness. It’s a must read for wisdom that applies to building wealth and achieving success. Last on the list is The Total Money Makeover by Dave Ramsey. I know there are some strategies and viewpoints of Ramsey that are personal or debatable, but isn’t that true of most things in life? The book is a good starting place for the person who is just not getting anywhere with their current financial habits. It’s for those who are frustrated with finances and want a plan to get out of debt. I’ve taken Financial Peace University and attended Dave Ramsey’s Smart Conference. All of his training materials and resources are helpful. He’s helped so many people get mad at their debt, myself included. The snowball method works and it puts a plan of action in the hands of people who don’t know where to start. I truly believe books are the cheapest investment that give you the biggest return. Money and time well spent. These are five that have impacted my life and finances in a major way. The words are packed with wisdom that paves the way to financial success. Any personal finance books you would recommend?